How do you not burst out laughing? That's priceless. ps-love the new avitar dude! Tell him it's because Uncle Earl was wishing for just one eyeball for him. So his current two are just a result of the law of averages. OH MY GOOD THAT WAS AWESOME!!! O-HEY! No problem with mistaking my son for a girl. Everyone does that. It's only going to get worse because we are letting his hair grow, rock star style. and HEY-who is the hottie in your new profile! That is the funniest thing I have heard from a kids mouth in a long time! Thank you for sharing.. kids are GREAT! I wanna know WHY he's wishing for a 3rd eye ball!!!!!! And with that comment... mini-Slyde won that conversation!!!! LMAO - yep - definitely a mini Slyde! Too cute! I would've wanted a third eye as a kid too. He's definitely creative! Heh. Kids are awesome. Way more awesomer than us adults. paige: i thought so too. sunshine: its hard to argue with that kinda logic..
candy: thanks! i felt i needed an update. liz: you're talking about meeting ME again, right? earl: he's only 6.. he doesnt understand averages yet. ali: oh, hes a veritible BLAST..
dizz: yes, he is the light of my life..
alley: i'll never be able to learn that. teeni: i'd probably prefer just one big eye, like a cyclops..
michele: thanks missy. right back at ya. Tamara: of course its me. and whats the "hmmmmm" for, missy? I got my 3rd eyeball.....finally, I wished and wished for the insurance company to cover the elective surgury.....and they finally came through! Ha Ha! I LOVE to hear the things kids have to say. It just makes my day. 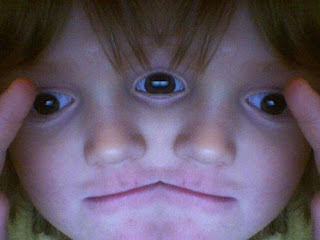 3 eyeballs....that kid is too funny!